Tokyo’s Robot Restaurant cabaret show is a must-see for fun-seekers visiting Japan. Like nothing you’ve ever seen before, it’s a crazy mash-up of robots, laser lights, music, theatre, props and dancers. Find out how to get discount Robot Restaurant tickets, coupon deals and the lowest prices. And what you can expect and need to know, to make the most from your trip. 52% OFF Robot Restaurant Discount Tickets: Compare Prices & SAVE! Compare the cheapest Robot Restaurant tickets. Save even more with discount code offers from Voyagin (up to $40 OFF!) and Klook! Note: There are limited tickets left during April. Don’t be disappointed and buy today! Best Robot Restaurant discount ticket offers! Savings compared to on-the-door prices $71.51 (¥8,000 Japanese Yen). Zero savings, you’ll pay more! Voyagin has fantastic Robot Restaurant coupon deals and exclusive front-row seat upgrades. And, pre-order bento boxes, and discounted popcorn and drinks. Voyagin’s offer is for Robot Restaurant and any other bookings with them. With coupon savings up to 9%, it may offer a better discount if you’re travelling in a group. Get $5 OFF your booking with our exclusive Klook Robot Restaurant promo code! With cheap ticket offers and pre-ordered bento boxes, Klook has impressive deals. Get $5 OFF with the new promo code! The Robot Restaurant Tokyo price on-the-door is 8,000 Yen ($71.48 USD ) or 7,500 Yen direct online. Bento box food costs between 1,000 to 1,500 Yen. Compare the lowest prices and get 52% OFF! The Robot Restaurant cabaret show is pure fun. A once-in-a-lifetime pleasure palace for people who don’t take life too seriously. Be entertained as you’ve never been before with an insane mash-up of crazy characters, lavish costumes, banging music, sensational lights at a wacky venue. Japanese cultural and folklore themes run throughout the show. A dizzying array of Kabuki theatre, samurais, ninjas, Taiko drummers, monsters, geisha, and of course, robots! 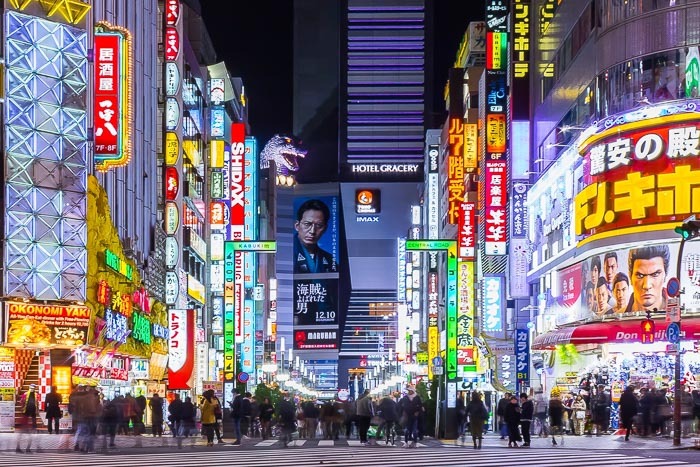 Set in the heart of Kabukicho – Shinjuku’s famous red-light district – you’re in for a feast of entertainment and neon lights. Around Kabukicho, you’ll see Godzilla looming high above the streets, its iconic red gate, and endless bars and restaurants. Why not, watch the show, eat yakitori (chicken skewers) at Omoide Yokocho (known as ‘Piss Alley’), go bar-hopping in Golden Gai, and crash out in a ‘Love Hotel’. On my journey, I’ve seen some weird stuff while travelling for a decade, and living in London and Japan. For me, the Robot Restaurant show is the ultimate theatre of pulsating energy, weirdness and originality. For the crazy ones out there, it’s a unique experience even you’ll never forget! I’ve seen Jimi Hendrix. I’ve seen Janis Joplin. I’ve seen David Bowie Diamond Dogs. I’ve seen Colleen Dewhurst and Jason Robards in A Moon for the Misbegotten, directed by José Quintero on Broadway, considered one of the greatest productions ever. And this was the greatest show I’ve ever seen in my life. Here’s what you need to know to plan your trip. The main Robot Restaurant cabaret show evening times are the same every week. On Fridays to Sundays, there’s also a more family-friendly afternoon show, which includes photos with the robots. Note: You must check-in at least 30 minutes before the main show starts. Save money on pricey on-the-door entry with discounted Robot Restaurant tickets! Get instant access with a confirmation voucher sent to your mobile phone. We recommend you arrive before the Live Robot Music opening act. It’s performed in the dazzling and multi-coloured Rainbow Lounge. Save money on pricey on the door entrance with discount tickets and coupon offers. Get instant access mobile e-tickets on the day of the show. How long is the Robot Restaurant show? The main Robot Restaurant cabaret show lasts for 90 minutes. During that time, there are a few breaks between acts where you can buy refreshments. The whole event, including the pre-show, is around 2 hours and 30 minutes. For example, event timings for the 5.55pm main show. The Robot Restaurant has plenty of bento box light meals, snacks, and drinks served during the evening. But, contrary to its name, it’s not a restaurant! All meals are served with a bottle of mineral water. Look out for free drinks promotions and discounts with Robot Restaurant tickets! Robot Restaurant, Tokyo: Is it Worth it? Is the Robot Restaurant worth it? You bet it is! If crazy, bonkers, insane and ridiculous resonate with you, you’ll love the Robot Restaurant. Only Tokyo could put on an evening cabaret show so outlandish, fantastically fun and damn right weird! Believe me, you won’t see anything like this in Las Vegas or anywhere else. With so much attention to detail that’s gone into the props, costumes, visuals and sounds, it’s no surprise most reviews are positive. The happy vibes, vigour and dedication from the performers made it for me. They all looked like they were having such a wonderful time! Get the most out of your Robot Restaurant cabaret show trip with my top tips! Don’t miss the pre-show lounge bar act! Listening to a live artist singing soft melodies with a robot band is worthy of the main show itself. Soaking up the atmosphere with a drink (or three!) in the spaceship-like room gets you in the cabaret mood. Arrive on time for the start of the pre-show, as mentioned above, it’s fantastic! And definitely, don’t be late for the main cabaret show, or else you won’t get in! In Japan, being on time is essential, and the show must go on. Don’t leave it to chance, arrive early! Loud sound-effects, flashing lights and some of the costumes, make the cabaret show unsuitable for young children. The Robot Restaurant has toned down the more risqué elements of the show, so you don’t have to worry about that. Although, Kabukicho is a red-light district and while tame by many standards, still has a seedy underbelly. Definitely not the ideal place for a family day out! Best to use your own judgement on whether to bring children. If you do, the afternoon show (Monday to Friday) has photo opportunities with the robots. You’re not allowed to wear sunglasses or excessive costumes (like or large wigs) at the show. And if you have visible tattoos, you’ll need to cover up. Also, don’t arrive drunk or dishevelled as you won’t get in. 5. Robot Restaurant or cabaret show? A Robot cabaret show with light meals and snacks would be a more apt way of describing it! While a bento box is a novelty for some (and the food in Japan is always high quality), it’s not a restaurant. Tokyo is the number one food destination in the world, have your evening meal somewhere else! Or, take a food tour in Tokyo to discover the cities culinary culture. The Robot Restaurant always sells out days (or weeks!) in advance during cherry blossom season in March and April. And weeks before, you’ll find it difficult to get the exact date and times. Other busy seasons include autumn leaves (mid-November to early December), Japan’s Golden Week holiday from 29 April for one week, and around Christmas. Bookmark this page for Robot Restaurant discounts, cheap tickets and coupons. Save over 40% booking in advance so you can enjoy more of Tokyo’s nightlife for less! The Robot Restaurant’s located in Kabukicho, a few hundred metres from Shinjuku Station. One of Tokyo’s premier entertainment districts, it’s brimming with restaurant, bars and shops. Shinjuku evenings buzz with excitement and neon lights which makes it an ideal base in Tokyo. Here are my top picks of places to stay near the Robot Restaurant. Tokyo’s Robot Restaurant is in Kabukicho, Shinjuku’s red-light and entertainment district. To get from Shinjuku Station to Robot Restaurant by foot, follow the blue dotted line on the map and the instructions below. Leave JR Shinjuku Station from the East Gate. Exit the ticket barrier and follow the yellow sign above you to ‘Kabukicho’. Go up the stairs on the left-hand side. At street level, keep to the left and walk ahead. Take a right at the first pedestrian crossing and continue in that direction across the square until you see Gucci. Cross the main road and walk up the side road between Gucci and Mizuho Bank. Continue walking in this direction. Cross the main road (Yasukuni Dori) and walk up the side road to the right of Family Mart and pass under the ‘Kabukicho Sakura-dori St.’ sign. Continue walking until you reach the Robot Restaurant. Look out for the big neon ‘Robot Restaurant’ sign, you can’t miss it! The Robot Restaurant cabaret show is a unique experience that you will never find anywhere else in the world. The smart mix of traditional Japanese percussion, singing and dancing, contrasts with contemporary high energy, dazzling lights, robots, monsters and dancing girls. Be bedazzled by this spectacular, choreographed show of special effects, LED lights and garish costumes. The Robot Restaurant in Shinjuku Tokyo is the craziest fun-packed show that you can only find in Japan! Get the latest deals on 2019 Robot Restaurant cabaret show discount tickets at Food Tours Japan.